A great thinker once said that "all philosophy is merely footnotes to Plato." Through Plato, Father O'Connell provides us here with an introduction to all philosophy. 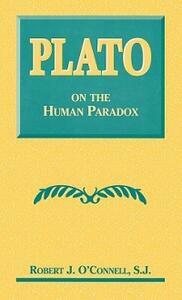 Designed for beginning students in philosophy, Plato on the Human Paradox examines and confronts human nature and the eternal questions concerning human nature through the dialogues of Plato, focusing on the Apology, Phaedo, Books III-VI of the Republic, Meno, Symposium, and O'Connell presents us here with an introduction to Plato through the philosopher's quest to define "human excellence" or arete in terms of defining what "human being" is body and soul, focusing on Plato's preoccupations with the questions of how and what it means to have a "good life" in relation to or as opposed to a "moral life."